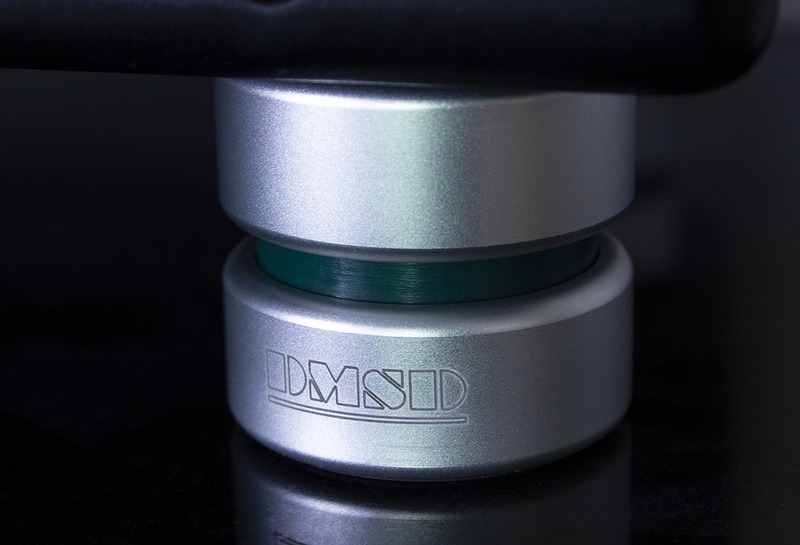 Dave Mastrodonato's DMSD 60 Pro speaker decouplers (reviewed in SOS July 2017:www.soundonsound.com/reviews/dmsd-60-pro) were designed to isolate loudspeakers weighing 11kg and upwards from the surface on which they're placed. The newer DMSD 50 Pro design employs the same principles and materials, but is intended for smaller speakers — we're told that it has been optimised for speakers weighing up to 12kg (ie. most nearfield monitors). They're also more affordable. As with the DMSD 60 Pros, I tested the DMSD 50 in a couple of ways. First up, I wanted to do a very basic 'fingertip test' to check that they were doing what's claimed — I placed one of my Dynaudio M1 monitor speakers (about 11kg) on a large office-style desk that I know full well can vibrate annoyingly, placed my finger on the desk and felt the vibration when I played back some music. To check that this was due at least in part to mechanical vibration and not just airborne energy, I lifted the speaker up and put the DMSD 50 decouplers beneath and repeated the test at various playback levels. The vibration of the desk was reduced by the decouplers to the extent that it was pretty much imperceptible until I increased the playback volume to levels I wouldn't normally ask of my nearfields. Yes, this might strike you as a very basic test but, importantly, it took the impact of speaker height on the perceived sound out of the equation. So this suggested that the speakers were indeed transmitting energy to the desk mechanically, and that the DMSD 50 prevented them from doing so. When it comes to perceived changes in the sound, I'm afraid it's simply not possible to conduct proper blind tests — these would require near-instant switching, which is impossible if the speakers and isolators are to remain in the same physical location. Nonetheless, after moving the speakers back to my studio, where they sit on the speaker platforms of my Omnirax studio furniture, I conducted some subjective listening tests, using a set of reference tracks (both commercial ones and some of my own material) with which I'm very familiar. I placed the speakers at different times on several different isolation products that put the speakers at broadly the same height (Auralex MoPads, IsoAcoustics ISO-L8R430 and DMSD 50). I also tried placing the speakers on a small wooden platform (of about the same height as the decouplers) that should couple the speakers to the stands beneath while keeping the speakers in the same place. All made a difference — which suggests that speaker position was one factor influencing the sound. The IsoAcoustics and DMSD products, though, seemed better-sounding to me than the platform, and better than the MoPads too, with a tighter-sounding low end in particular, and a more stable stereo image. So it would seem there are other factors at play. There was less of a difference between the IsoAcoustics and DMSD models, but I found myself preferring the DMSDs. Often overlooked in the debate about speaker accessories like these is their appearance and their versatility. I have to say that the DMSD decouplers look very classy indeed — you have various different colours to choose from, and the finish is of a very high quality. Their modular form (there are four individual 'feet' for each speaker) means they're less inclined to attract dust than all-in-one designs too, and easier to clean. They're also very versatile, since the feet can be arranged as you wish to accommodate different shapes of speaker — my dual-woofer Dynaudios, for example, are narrower at the rear than at the front). All in all, then, I believe that these DMSD 50 decouplers are effective and stylish decouplers. If you have an issue with the mechanical transmission of vibrations from your nearfield speakers, these will solve it, and they'll keep your studio looking great while they're at it. £239 including VAT (eight decouplers, suitable for a pair of speakers). $295 (eight decouplers, suitable for a pair of speakers).